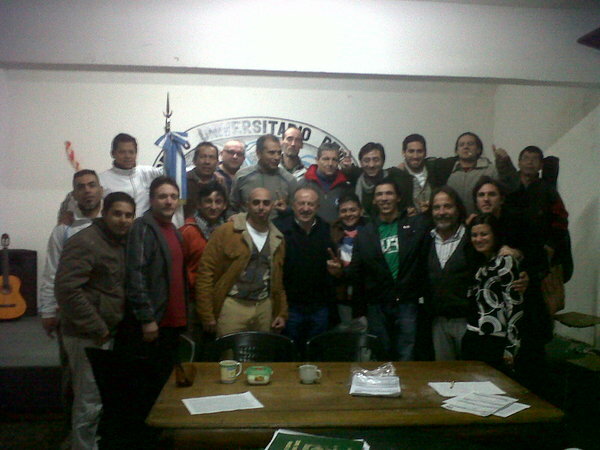 BUENOS AIRES, Jun 7 2013 (IPS) - The first prisoners’ union in Argentina, a country with a strong organised labour tradition, fights for the rights of inmates. “No one had never fought before for anything like this in here,” 33-year-old inmate Gustavo Moreno, serving a 22-year sentence in the Complejo Penitenciario Federal in Buenos Aires, better known as the Villa Devoto prison, told IPS. Moreno, who has been in prison for three years, works on the cleaning detail. He is also the coordinator of the foundation course at the university education centre there, and is studying Business Administration. Moreno is the social action secretary for the new prisoners’ union, the Sindicato Único de Trabajadores Privados de la Libertad Ambulatoria (SUTPLA), created in July 2012, which is recognised under an agreement with the Federal Penitentiary Service (SPF). SUTPLA belongs to the centre-left Central de Trabajadores de la Argentina (CTA) trade union federation, whose leaders said the prisoners’ union is being closely watched by the International Labour Organisation (ILO) as an example that could be followed in other countries. “We have 700 male and 100 female members, and the basic idea is to defend the rights of people who are in a defenceless and vulnerable state,” Rodrigo Díaz, the secretary-general of SUTPLA, who has been out of prison on early release since April, told IPS. At present they are seeking legal union status with the help of CTA lawyers. Once this is achieved, they will have to begin collecting union dues, but this is not an important concern for the organisation. The growing strength of the union fills Díaz with enthusiasm. He has been in prison a number of times – “a total of 12 years in different prisons,” he said. He started studying law behind bars and is now continuing his studies on the outside. He has only one year to go to graduate. Through his studies and the time he spent in different prison facilities, he has learned about the labour rights of inmates, which are not always respected. “The prison service does not see it as a question of rights but of benefits,” he said. At present 64 percent of the nearly 10,000 prisoners in the SPF are working. Another 49,000 prisoners are inmates in facilities dependent on provincial governments, where the proportion of inmates doing remunerated work varies. The Justice Ministry established that all prisoners who worked would receive the national minimum wage, equivalent to 553 dollars a month, regardless of their actual working hours. But in practice, most working inmates are paid much less, because the SPF makes a number of controversial deductions. “Someone is keeping the difference, very probably ENCOPE,” Díaz complained. ENCOPE (Ente de Cooperación Técnica y Financiera del Servicio Penitenciario), an agency for technical and financial cooperation with the prison service, “does not fulfil the functions for which it was created…and actually oversees itself,” the trade unionist said. Víctor Hortel, the head of SPF, has admitted that in the past there were irregularities in the deductions that were made, which were supposed to be credited to a reserve fund for prisoners when they were released. But he denied that these practices continued, now that anti-corruption bodies are exerting greater control. With the help of CTA lawyers, the new union lodged various appeals against deductions from imprisoned workers’ pay, except for contributions toward their future pensions. This year, the fight against deductions and other labour demands led to the first strike by SUTPLA workers, lasting 72 hours. The union is also demanding that proper clothing and footwear be issued to workers for safety and health reasons, especially when they handle waste or other contaminating materials. Díaz has met with social security authorities to negotiate payment of six months unemployment benefit for newly released prisoners, just like any other person dismissed from a job. He himself received wages until April for his work in the Villa Devoto prison, but was left without an income as soon as he was freed, six months before completing his full sentence. He said the worst situations were found in prisons run by the provincial governments. “In Unit No. 1 in Olmos (in the province of Buenos Aires), inmates are ‘paid’ with just two telephone cards a month,” he said. In some prisons, inmates work in exchange for benefits such as visitors’ permits on weekdays. But work is not seen as part of rehabilitation, or a right, or something that should be remunerated, Díaz said. “The idea is not instilled in prisoners that they can learn a trade through working, and also help their families. That is why the recidivism rate is so high,” he said. Against this backdrop, SUTPLA wants to strengthen trade union activity in the Villa Devoto prison, where the organisation was founded, and then extend the same rights to other men’s and women’s prisons. The work done in prisons is varied and includes agricultural production – vegetable gardens, nurseries, growing fodder, dairy production – and industrial workshops – printing, sportswear, bicycles, bags and furniture. Maintenance work is another option, like the cleaning work done by Moreno, the social action secretary of SUTPLA, for which his net monthly income is 385 dollars. “I’m working for my kids,” he said. He has four children, aged 13, 11, seven and one. “What I do for myself is study. That will give me a tool when I get out,” said Moreno, who is waiting to hear whether his sentence has been reduced. “Studying is my way of detaching myself from life inside,” he said. He has been in prison before, and managed to finish his secondary schooling. “I had no opportunity of doing that on the outside,” he said. NEED SECURITY HELP WHILST HELP BOTSWANA TO BUILD MAHALAPYE CITY DID THE SAME SOUTH AFRICA LEPHALALE 2004 AND 2005 LEPHALALE LIBRARY WORK USING CASE CMMMY00075-12 MAHALAPYE BOTSWANA . NEED TO BE A MEMBER OF THE UNION FOR PRISONERS A PRISONER IN BOTSWANA IMMIGRATION DETENTION .